Belle Savanne, Sulphur's new exclusive luxury apartment community offers 5 floor plans including one bedroom, two bedroom and three bedroom apartments. The spacious one bedroom one bath plan options range between 670 and 724 square feet. The two bedroom two bath plans are spaciously designed between 1,110 and 1,143 square feet. The three bedroom apartment tops out at 1,262 square feet. Separate utility rooms for the full size washer dryer are a big plus, as are the huge walk-in closets. There will be plenty of space for all your stuff. Belle Savanne offers short term leases, long term leases, and month-to-month leases. The floor plans with room sizes will help you plan your move as will our furnished model once construction is completed. 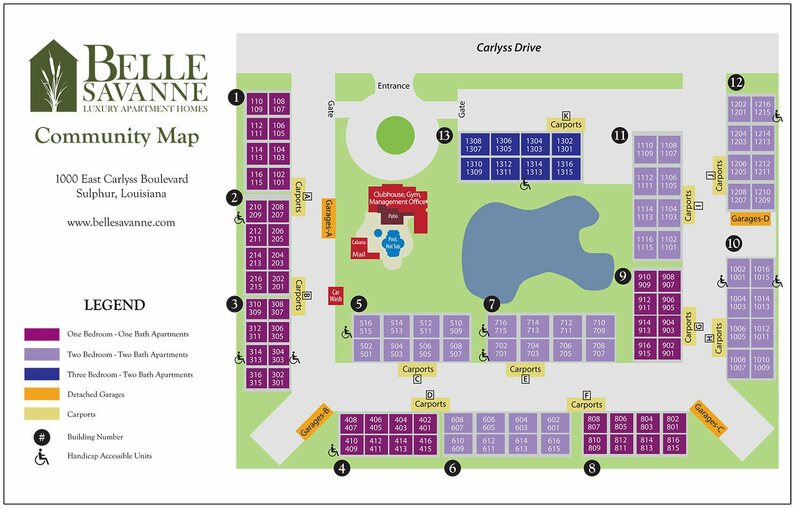 Our community site plan map will give you a great sense of the community and will help you pick your brand new apartment!